If a user has been manually added to a course but has not yet accepted the course invitation after a period of time, you can resend the course invitation. You must allow at least 24 hours before resending a course invitation. Note: Users are not sent a course invitation until the course start date. (The start date is commonly the term date, unless the term is being overridden by a specific course or section date in Course Settings.) Additionally, courses must be published for students to receive course invitations. User enrollments display as pending until the course invitation is accepted. To resend an invitation, locate the user's name and click the Options icon , then select the Resend Invitation link . To resend all pending invitations, click the Resend link. Note: The Resend link does not display until at least 24 hours after a user received the course invitation. Previous Topic:How do I edit sections for an enrollment in a course? Next Topic:How do I deactivate an enrollment in a course? 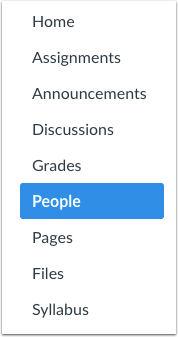 Table of Contents > People > How do I resend student invitations to a course?